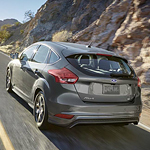 The Ford Focus is a popular car because it has trendy exterior design elements that are very appealing. When this car is mobile or parked, its paint, headlights, and other exterior components command attention. Along the edge of this vehicle's frame, there are rocker moldings that provide flair. Near these moldings, you'll find valances that are low to the ground and a sporty spoiler. All of the individual components on the exterior are stylish; however, they also serve another purpose, which is to boost performance on the road. For example, each 18-inch aluminum wheel can power the Ford Focus ST effectively and efficiently over typical hazards, such as potholes and puddles. If you want to drive a car that has wheels with colorful pockets, a sporty spoiler, and other designer features, the Focus ST is a great transportation option. This particular trim is available for sale at Ken Garff St George Ford Lincoln.